A group of cycle-enthusiasts at Ford have created a brand new ‘smart jacket’ designed to keep cyclists safer on the road. The jacket has sleeves that light up to show when wearers are turning right or left – or even if they are braking – and can be wirelessly connected to a smartphone for helping with navigation. When connected to a smartphone, the jacket’s bike-friendly navigation app vibrates the appropriate sleeve, so riders know which way to go without having to look at their phone and guides them using routes that avoid busy roads and junctions and are cycle safe. Audible and haptic interfaces enable riders to take calls, receive messages and repeat navigation guidance. The use of bone conduction headphones avoids blocking out sounds from pedestrians and other road users, as earbud headphones might do – sending sound to the inner ear via vibrations to the jawbone. 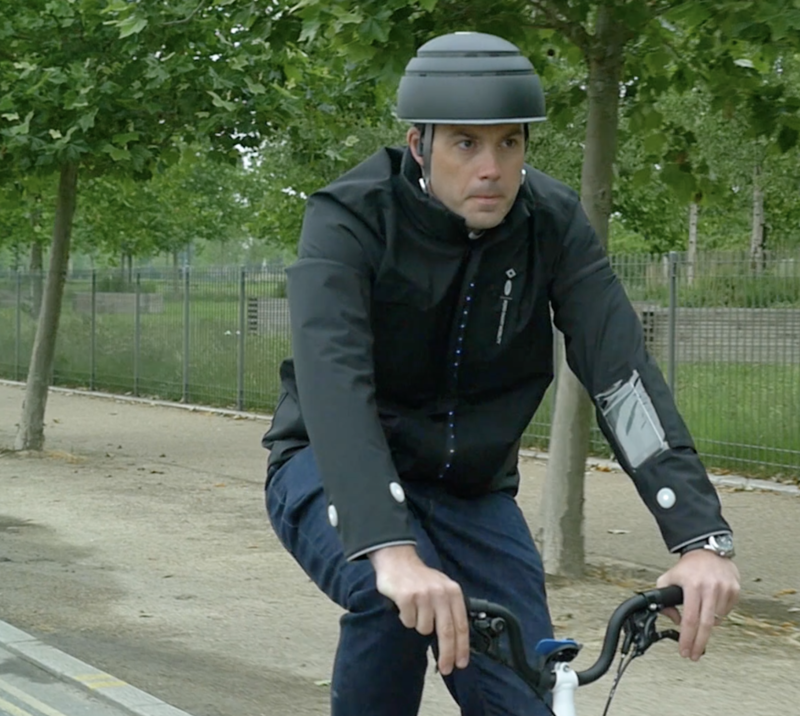 Developed with urban cycling clothing specialists Lumo and mobility software experts Tome, the smart jacket has been trialled on the daily cycle commute to the Ford Smart Mobility Innovation offices in London. Employees were charged with researching the “last-mile” challenge. This refers to the last-leg of a journey not only in the context of a personal commute but also around delivering goods and services in dense and congested urban environments. This leg is generally associated with higher cost and more complexity. The smart jacket concept ties into Ford’s “Share The Road” campaign that aims to foster greater harmony and empathy between both drivers and cyclists. It also coincides in the UK with Bike Week UK and London Tech Week. “At Ford, we want to help people – and goods – move more safely, confidently and freely around our cities,” said Tom Thompson, project lead for the Ford Smart Mobility team. Developed with urban cycling clothing specialists Lumo, and mobility software experts Tome, the smart jacket concept currently remains a prototype. However, Ford is in the process of securing the patent that it might in future be further developed or licensed to others, along with the companion app and know-how. Bicycles are becoming ever more popular in urban environments for commuting, for recreation and for delivering goods and services. During the morning peak, cycling is in fact the most popular mode of transport in the City of London where around three times as many people now ride compared with in 1999.